1. The City of Oakland is pitching four sites for a new ballpark near downtown for the A’s, including the Howard Terminal spot near Jack London Square, the Bay Area News Group$ reports. Besides Howard Terminal, the sites include the US Postal Service site in West Oakland, a spot on the Laney College campus, and one in the Brooklyn Basin development on the Estuary. 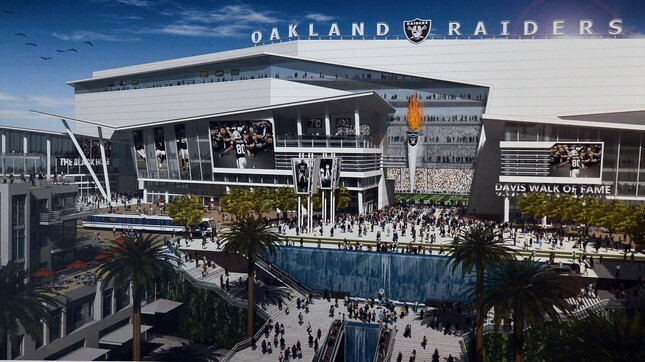 The city prefers that the A’s be closer to downtown, thereby leaving the Coliseum site for the Raiders. The Howard Terminal spot, just west of Jack London Square, appears to be the most viable. 2. The city, meanwhile, likely will miss the NFL’s December 30 deadline for coming up with a concrete financial plan to keep the Raiders in Oakland, the Bay Area News Group$ reports. The city does not have the financial wherewithal to meet the Raiders’ request that taxpayers pay for about half of a new $1 billion stadium. However, the city is hopeful that the Raiders do not have the votes among NFL owners to move to Los Angeles. was a fake, the LA Times$ reports. The man, William Celli, 55, is charged with a felony count of making criminal threats with a hate crime enhancement. 4. Southern California Gas Company officials say they have pinpointed the natural gas leak that has caused the evacuation of thousands of residents in the town of Porter Ranch, the LA Times$ reports. The leak has released massive amounts of methane gas, a powerful greenhouse gas. So Cal Gas said it could take three more months to fix the problem. 5. And Solar City, a powerhouse in the home solar industry, is pulling out of Nevada because that state decided to dramatically increase costs for home solar users at the request of the state’s utilities, the LA Times$ reports. The San Mateo-based Solar City said the rate hikes on rooftop solar make it financially unviable for homeowners now in Nevada.